This is the original AG7 Space Pen with the addition of a symbolic gold tone replica Space Shuttle Emblem attached to the clip. 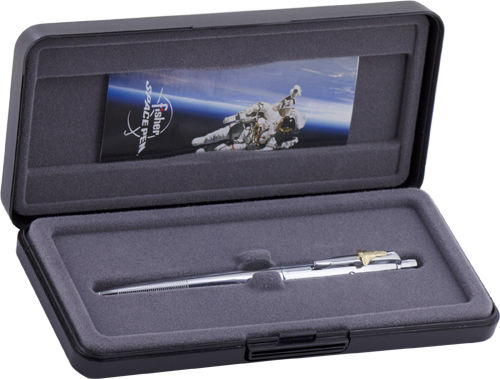 This is the original Fisher Space Pen that was used on the Apollo 7 space mission in 1968, after 2 years of testing by NASA, and has been used on all manned space flights since then. The design and construction of this pen has not changed in 36 years. The pen you buy today is exactly the same as the one taken to the moon in 1969. It is a heavy pen, and the weight rests reassuringly in your hand as you write. The AG7 is made from solid brass with an extremely hard chrome plating. It has a very positive and substantial feeling click mechanism. You press down on the top to extend the refill, and press the side button to retract the refill. Its special design assures you that you'll always retract the point before you slide it in your pocket. It's constructed of brass and steel components of the highest quality, and is made in the USA. 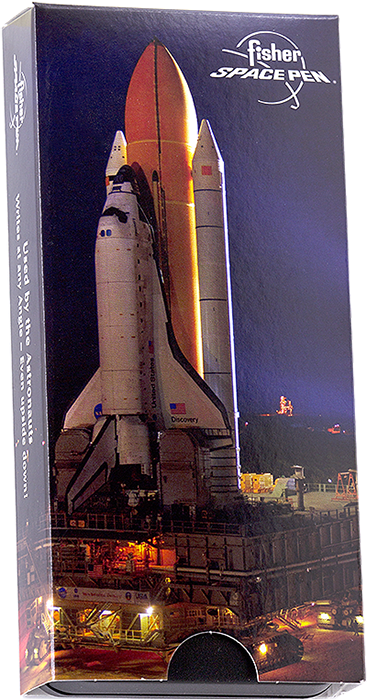 All Astronaut Pens are attractively packaged in heavy duty gift boxes with flock lining, and come with a pamphlet describing the history of the Fisher Space Pen. Used on all NASA Apollo and Shuttle missions, the International Space Station (ISS), Russian Soyuz and MIR space flights, the French ARIANE Space Program, and the Everest North Face Ski Expedition. The AG7-SH in its case.